For a while now, I've done LJ polls soliciting anonymous comments before taking a flight. The idea was originally stolen from creepingivy a few years ago, and I've kept on doing it regularly. Fourteen months ago, while leaving for last year's Blizzcon, I did the usual. Someone let me know they were single. Immediately, a piece of wisdom from a good friend came to mind - no one lets you know a change in their relationship status unless they intend you to do something about it. Turns out, she had no such thing in mind, and was still working through things on her end. But after returning from Blizzcon, I got talked into giving it a shot and asking her out by maidoftheshore. We discussed this after last year's MP3 Experiment, as I walked around Manhattan chatting with people on the phone. I finally asked her out, and even invited her to last year's handout party, but ultimately our first date was a day after that - a month after the LJ poll was posted. 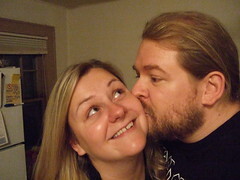 Thirteen months later, and jedimentat and I are still together. I love her dearly, and am really glad I posted that LJ poll. And asked her out. As the year wraps around, I'm often reminded of last year's events. This year, she did go to the handout party, and even helped out at handout. Instead of calling everyone about her after the MP3 Experiment this year, I called her. And now, packing for Blizzcon, I've got a loving email in my inbox from her instead of a poll answer that makes me pause for thought. But, so as not to break tradition, here's the usual poll. What's something you would regret not telling me? And hey, if there's something you want to tell someone else? Don't wait.